The Department of Justice inspector general will complete his investigation into potential surveillance abuses against the Trump campaign by May or June, according to Attorney General William Barr. Barr revealed the expected release of the watchdog report in testimony to lawmakers during a House budget hearing on April 9, after Rep. Robert Aderholt (R-Ala.) asked the attorney general how it came to be that a “salacious and unverified dossier” was used to spy on an American citizen. Aderholt was referring to the Foreign Intelligence Surveillance Act (FISA) warrant the FBI used to surveil former Trump campaign associate Carter Page over the course of a year. The bureau used the then-unverified and now-debunked Steele dossier, funded by the Clinton campaign as the rationale for the warrant. DOJ Inspector General Michael Horowitz has been investigating the use of the FISA warrants in the Russia investigation since March last year. In addition to using shoddy and politicized evidence, the bureau’s process for obtaining the warrants was riddled with abnormalities. Barr also revealed that he himself is looking into the conduct of officials who worked the Russia investigation, most of whom have either been fired or left the bureau. 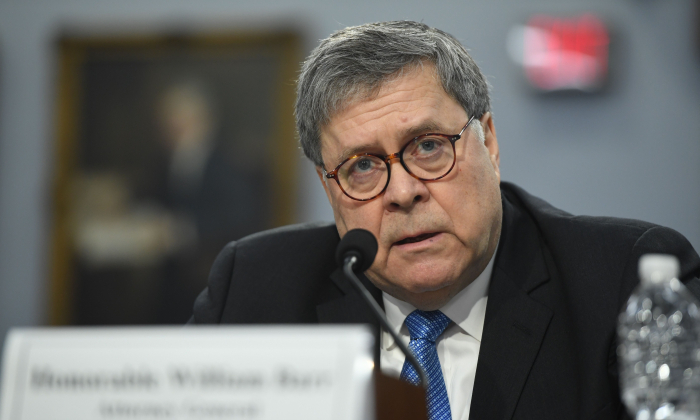 “More generally, I am reviewing the conduct of the investigation and trying to get my arms around all the aspects of the counterintelligence investigation that was conducted during the summer of 2016,” Barr said. The attorney general said he hasn’t received the criminal investigation referrals from Rep. Devin Nunes (R-Calif.) that the lawmaker mentioned earlier in the week. Nunes said he plans to refer eight people for criminal investigation for conspiring to lie to the FISA court and Congress. “I haven’t seen the referrals yet from congressman Nunes, but obviously if there is a predicate for an investigation, it will be conducted,” Barr said. Democrats on the committee pressed Barr for more information on the final report by special counsel Robert Mueller. The special counsel took over the Russia investigation from the FBI in May 2017. Barr said the mid-April deadline for releasing the report still stands. The attorney general said redactions in the report will be color-coded to indicate which rationale was used to withhold the information. Barr also dismissed accusations that he was hasty to release the March 24 letter outlining the conclusions of the report. He told lawmakers he met with Mueller on March 4 for a preliminary discussion of the report and that Mueller’s thinking wasn’t a mystery to people he interfaced with at DOJ, including Deputy Attorney General Rod Rosenstein. The DOJ offered to have Mueller review the March 24 letter, but the special counsel declined, according to Barr. Mueller concluded that neither Trump nor anyone in his campaign colluded with Russia. Mueller also summarized the reasoning for and against bringing an obstruction charge against Trump; Barr concluded there wasn’t enough evidence to take the case to court. Former FBI Deputy Assistant Director Peter Strzok launched the counterintelligence investigation of the Trump campaign in late July 2016. Strzok and his mistress, FBI attorney Lisa Page, exchanged text messages that exposed their bias against Trump, their intent to “stop” him from becoming president, plans for an insurance policy in the unlikely event Trump won the election, and the prospect of impeachment once Trump became the president-elect. Mueller removed Strzok from the special counsel probe upon learning about the text messages. The FBI obtained the first warrant to surveil Carter Page in October 2016. The application for the warrant alleged that he was an agent of Russia; Page was never charged with any crime and vehemently denies the allegation. The core of the warrant application consists of evidence from the so-called Steele dossier. Former British spy Christopher Steele compiled the dossier by paying second- and third-hand sources with ties to the Kremlin for the information. The Clinton campaign and the Democratic National Committee ultimately funded the dossier. The officials who compiled the application failed to disclose that the dossier was funded by Trump’s political opponent in the 2016 election. The bureau was also aware that Steele was biased against Trump but failed to include the information in the warrant application. Former FBI Director James Comey and former FBI Deputy Director Andrew McCabe both signed off on the applications. Both have since been fired by the Trump administration. In addition to the inspector general and attorney general inquiries, the potential abuses of the FISA system are the subject of an investigation by the Senate Judiciary Committee; Chairman Lindsey Graham announced the investigation last month. He also called for the appointment of a second special counsel to probe the conduct of officials who ran the Russia investigation.